John Kinsella’s latest foray into what has become known as ‘ecopoetics’ raises many more aesthetic and political questions than can be resolved in a short review. As in his Divine Comedy: Journeys Through a Regional Geography (2008), Kinsella makes vivid and considerable use of autobiography. He and his family are presented as embattled eco-pioneers in a region already much destroyed by bad farming practices, partly multi-national in origin, and roamed over at will by township hoons ready to shoot up anything that moves. Unlike those who threaten him, Kinsella seems to have made a close study of the flora and fauna of his region and is determined to do what he can on his relatively small property to preserve it (or restore it, in many cases). As a poet, the essential problem that arises for him is what kind of poetry can assist, or even document, such a struggle. 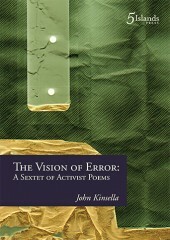 To judge from The Vision of Error: A Sextet of Activist Poems and some of the books that have preceded it, Kinsella has developed a wide range of strategies, some more successful than others. Sometimes, and more happily, these outbursts employ an Old Testament tone: ‘They will come in the garb of heaven and promise / longevity for the planet; /They will come as scientists telling us what is good for us, / deleting all choice; / They will sup with the string-pullers; / They will take us to the nethermost abyss and shilly shally / on the borders of light …’ One can almost hear Manning Clark in the background here. Of course, one is also aware of an echo from Walt Whitman. Indeed, a long-running and subterranean engagement with that poet (and also with John Milton, another political poet) runs along under much of the text. Unfortunately, the substance of these potentially interesting encounters is not greatly developed. There are only tantalising allusions along the way. Most crucially, however, towards the end of the book’s penultimate poem, Kinsella notes: ‘Our four-year-old, in the delirium / of fever, said: ‘Dad, write a poem / to make them stop, to stop / them tearing down the tree’. / He has more faith in poetry // and people than I have, / though I’d like to honour his wish.’ In many ways the whole of The Vision of Error is an honouring of that wish — but the poet’s misgivings about his task (‘He has more faith in poetry … than I have’) are also well-founded. Political poetry which is overly simple and dogmatic will ‘make nothing happen’ (to misquote Auden slightly). Most rants are in this category. Even Kinsella is driven to admit at one point ‘I fear my own rhetoric’. It is also true, however, that poetry which is overly complex and inaccessible to the ‘target audience’ has even less chance of ‘stop(ping) them tearing down the tree’, as it were. Lines such as ‘Rim Paste Quake Crestfall / ‘vagus inter stellas huius revelationis’’, selected almost at random, may sound fine as incantations but they are not likely to change entrenched opinion, particularly among those unfamiliar with Latin or the works of Christopher Brennan. This entry was posted in BOOK REVIEWS and tagged Geoff Page, John Kinsella. Bookmark the permalink.